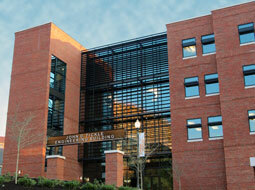 The John D. Tickle Engineering Building is a cascading montage of brick and glass nestled next to Neyland Stadium, across from the boat house at the University of Tennessee, Knoxville. The lead architect, Duane Grieve, principal at Grieve Associates Architects, made sure that not a single bad view existed within the building’s conference room, atrium, faculty offices, bay testing areas, labs or hallways. The building’s namesake rests in a display at the building’s entrance made from an EXTREN® DWB® (double web beam). This display represents only a small sliver of Strongwell’s product offerings. The school is connected to the campus with one of the modern marvels of civil engineering – a suspension bridge spanning over 120 feet. These types of bridges are traditionally manufactured with steel, concrete or reinforced concrete with extensive welding. This particular bridge contains FRP (Fiber Reinforced Polymer) composites utilizing EXTREN® DWB®, EXTREN® wide flange beams, angles, square tubes, SAFPLANK® flooring and decking, and DURAGRID® T-1700 products, all manufactured and pre-fabricated by Strongwell. The installation was done by Quality Machine and Welding Co. Inc., a structural steel fabricator and erector. 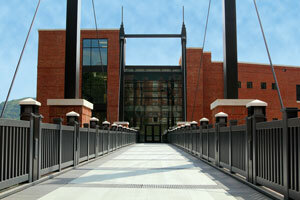 This bridge will provide multiple years of maintenance-free service as future civil, environmental, and industrial and systems engineering students cross into the threshold of the John D. Tickle Building at the University of Tennessee. The five-story, 110,000 square-foot building will be the second engineering building to go up on campus in as many years as enrollment for STEM (Science, Technology, Engineering and Mathematics) disciplines has skyrocketed amongst undergraduates and graduates alike. The building will be filled to capacity upon its first day of enrollment as eager students await the intensive environment of engineering. Click here to view the entire case study.